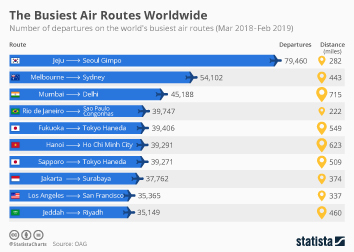 As the global economy is becoming more and more connected, the aviation industry is one of the fastest transportation sectors. Commercial airlines carried more than 4.5 billion passengers in 2018 and are expected to generate global revenue a value of 606 billion U.S. dollars in 2019. Air transportation also plays an important role for tourism, contributing to economic growth, especially in developing countries. The number of international tourist arrivals increased from 1.24 billion arrivals in 2016 to 1.32 billion in 2017; more than half of tourists chose to reach their destination by air transportation. Air transport also provides entrance to international markets and assists in the progress of world trade. Some 63.7 million metric tons of cargo was carried by air in 2018, generating around 109.8 billion U.S. dollars in revenue. Contrary to road or rail transportation, the aviation industry has to pay for most of its own infrastructure and maintenance such as runways, terminals or air traffic control. In 2018, airports spent a little over 75 billion U.S. dollars in infrastructure with Asia Pacific accounting for the majority of new airport projects in the region. The aviation industry provides a total of 62.7 million jobs worldwide. It directly generates employment opportunities within the airlines, air navigation services providers and airport operators and additionally creates jobs via the supply chain in the transportation of goods and services.